This past November, we took a two week road trip through Central Europe. After months of deliberation, we decided to fly into Vienna, rent a car, and voyage through Austria, Germany, Switzerland, and France. We spent just one or two nights in almost every place we visited and wrapped up with a four-night stay in Paris (sigh). We wanted this trip to be an overview, a sampling if you will, of all the best the region has to offer. We planned on picking and choosing our favorites to visit down the road. What we did not take into account, however, was the fact that we would fall in love with nearly every place we stopped. By the end of fifteen days, we were exhausted, stuffed with cheese, feeling oddly slim from all of the walking, and eager to do the entire trip all over again. We’ll detail each city in individual posts over the next several weeks. As far as the itinerary as a whole, we’d highly recommend this trip to anyone who is comfortable in a little bit of cold for a few reasons. The “off-season” of European travel begins in November. Flights and lodging (both hotels and Airbnb) are often much more affordable during this time. 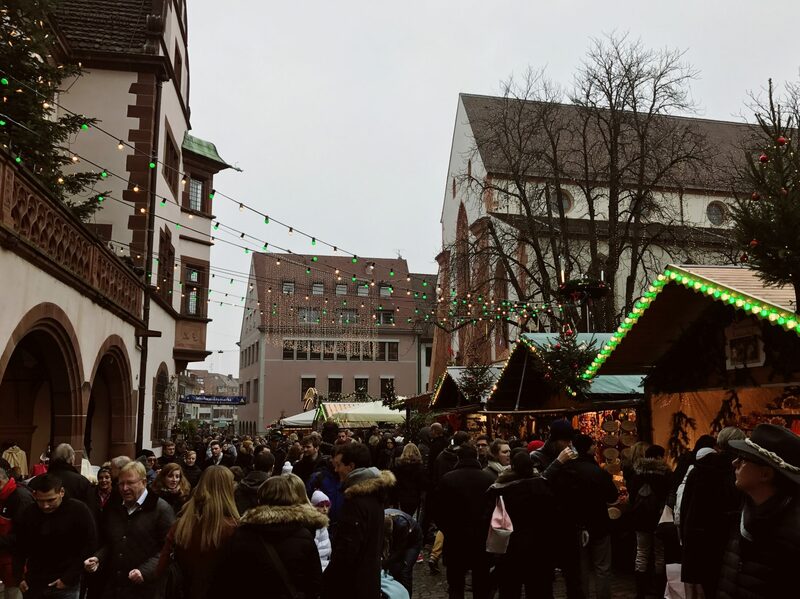 While the Christmas market areas are still crowded, most places we visited had fewer tourists than what we’ve experienced in the past while traveling during warmer seasons. It sometimes felt like we had entire towns to ourselves without our fellow loud Americans crowding the streets. While the weather was chilly compared to what these two Californians are used to, temperatures rarely dropped below 40℉ during the day for the bulk of our trip, except for a few days in the 30’s in France. It did get pretty cold at night, but it wasn’t unbearable. That being said, weather can be unpredictable in Europe during this season. We very well could have experienced heavy rain or even snow. Our biggest complaint about the off-season is that the sun set a little after 4:30, so we really had to make the most of the daylight we had. When it comes to the holiday season, these places are not messing around. Local vendors sell ornaments, decorations, and yummy drinks and food. I nearly lost it over all of the Christmas lights, trees, and festive music. The Christmas markets in Austria open in the middle of November. We just missed the start of the markets in Munich and Interlaken, but Freiburg, Strasbourg, and Paris were in full swing by the time we rolled through. This was the first trip that we’ve been on that we rented a car to get around, and it was the BEST decision. We loved having the freedom to come and go as we pleased. We took our time on the drives between cities and stopped whenever we wanted. Though there is certainly something to be said for using public transport as a cultural experience, we definitely will go the rental car route from now on. We didn’t realize before this trip how much time we had wasted in the past–trying to figure out where the train station is, attempting to interpret timetables online, begging ticket machines to take our credit card, then waiting for the train itself (all while trying not to get robbed). We saved so much time having our own way of getting around, and we experienced the area on our own terms.